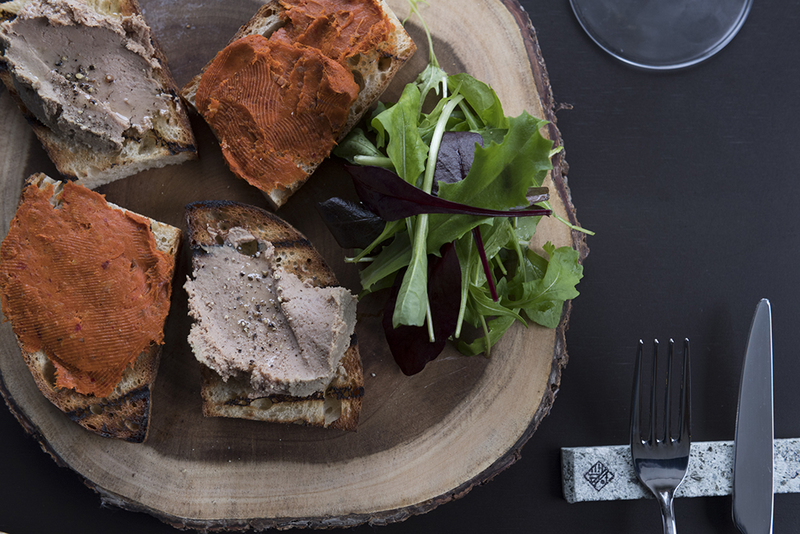 With plenty of new restaurants in town this year, the Powderlife team has been busy sampling what’s new on menus across the resort and neighbouring towns. Keep an eye on our Facebook page and Powderlife.com as we introduce you to the best new local restaurants and revisit some old favourites. 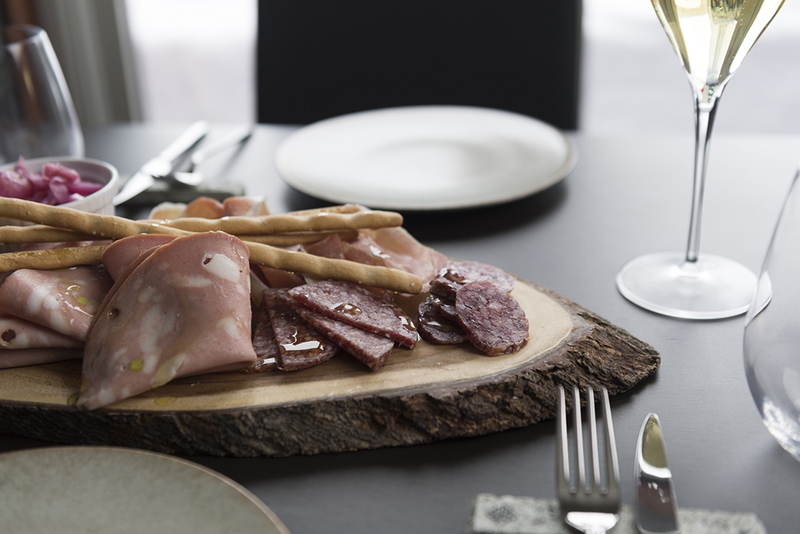 Niseko has inherited another brilliant European-trained Japanese chef with the opening of new Italian restaurant, Bi-on. 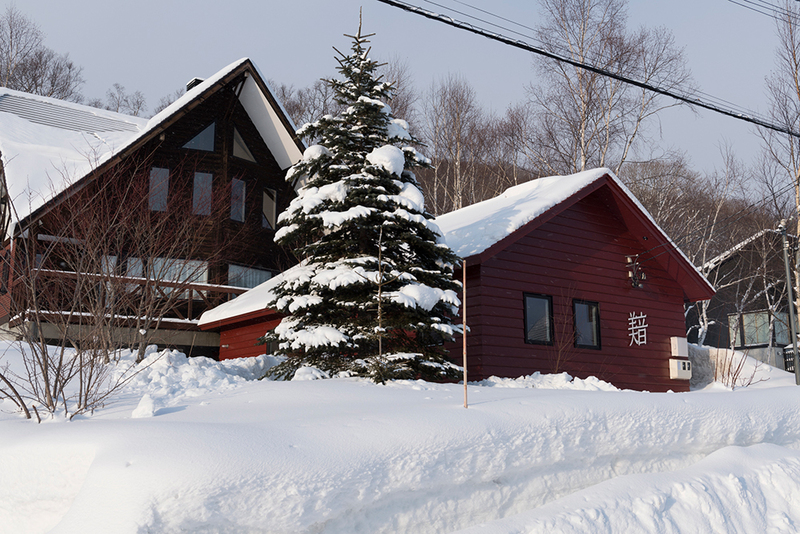 Located in a new forest-side mountain lodge in the hamlet of Izumikyo alongside Hirafu, Bi-on (pronounced bee-on) is a fresh new high-end addition to Niseko’s thriving dining scene. Chef Naoki Matsuoka was born and bred in Hokkaido, before training for several years in France and Italy, as well as working in restaurants in Singapore and Tokyo. For the past 18 years he has run his own restaurant – Restaurant Nao – in Chitose (near the airport). 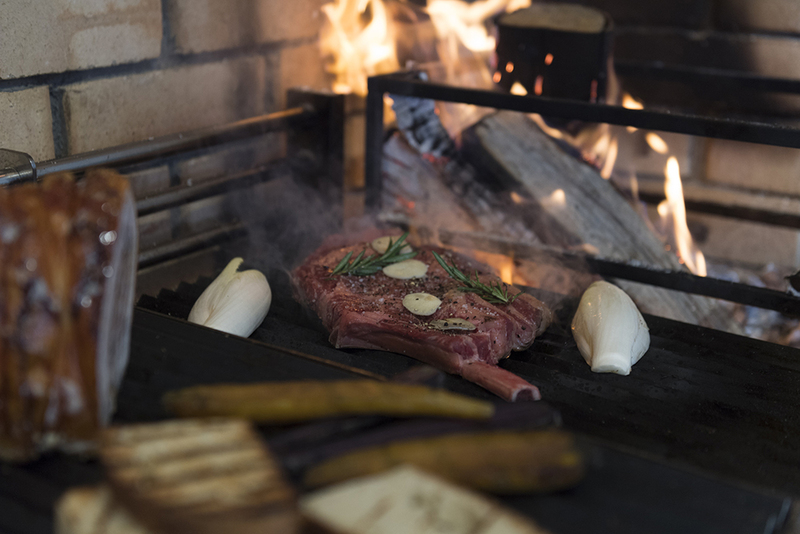 It was here that Tokyo investment banker-turned-restaurateur Toshio Nishimura first discovered Matsuoka-san’s exquisite Hokkaido-influenced, wood-fired Italian fare and had the idea to import him to Niseko in the winter months. 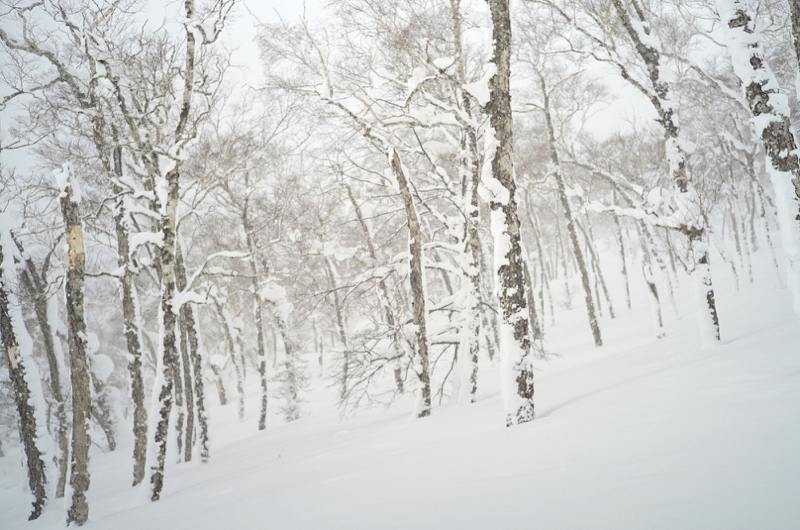 Nishimura-san already operated seven restaurants across Tokyo,Los Angeles, Singapore, Shanghai, Taipei, Australia, and from this year, two more in Niseko – Bion and Japanese obanzai restaurant Bikyo in Kutchan. 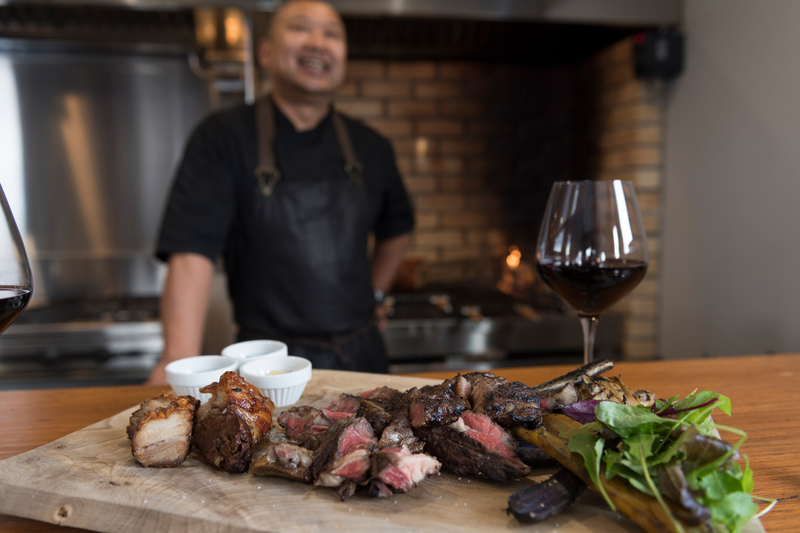 Chef Matsuoka’s speciality is wood-fired grilled meat, his decades of experience cooking with this technique obvious in the delicately smoky flavours of the wagyu beef and crisp-skinned porchetta pork cooked to tender, juicy perfection. It should be noted that Chef Matsuoka’s style is not strictly Italian, with plenty of Japanese culinary influence. 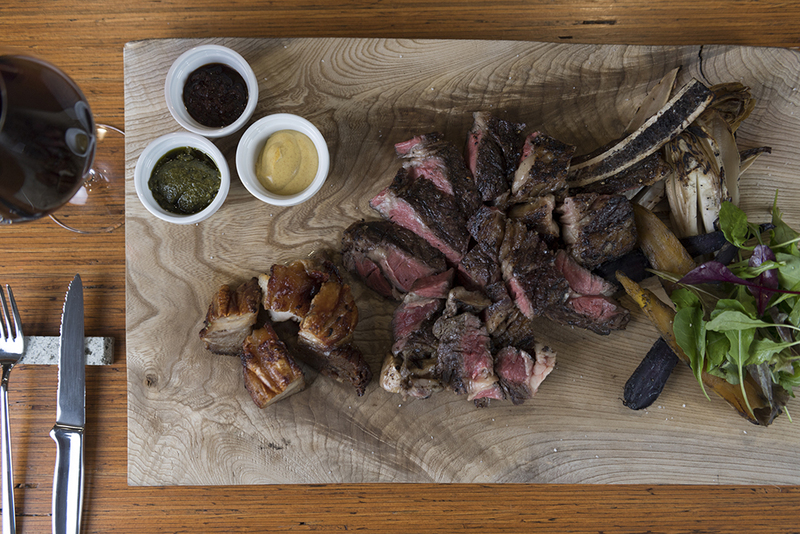 For instance, he points out the Hokkaido wagyu beef is basted with a soy-based sauce and offers freshly grated wasabi to garnish. 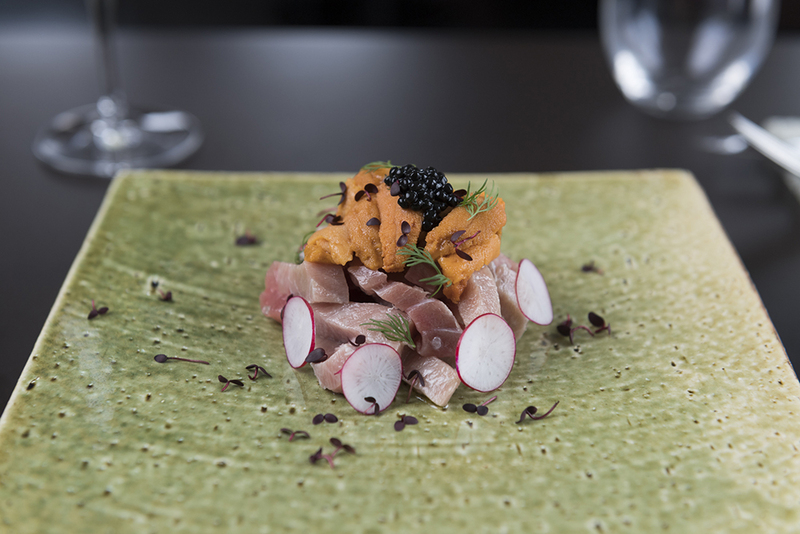 An assorted seafood plate contains ouma fatty tuna sashimi creatively paired with local uni (sea urchin) and caviar. 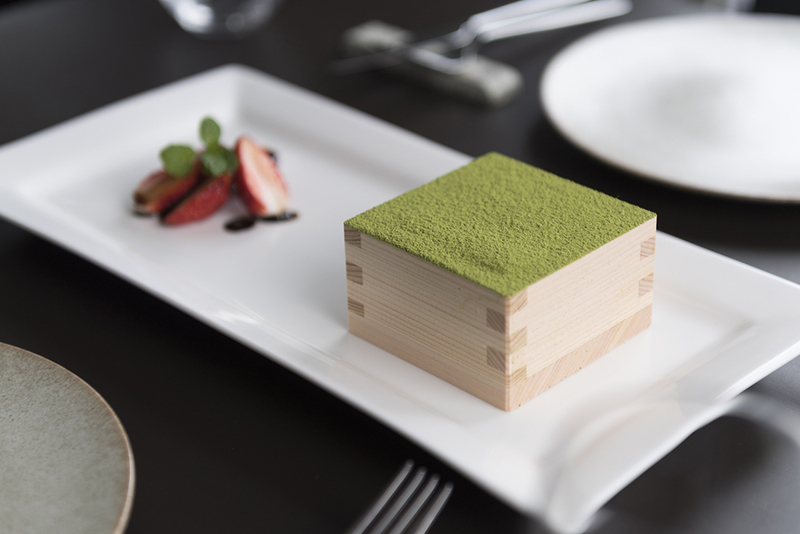 Dessert is a matcha- green tea flavoured tiramisu served in a sake masu (box cup). 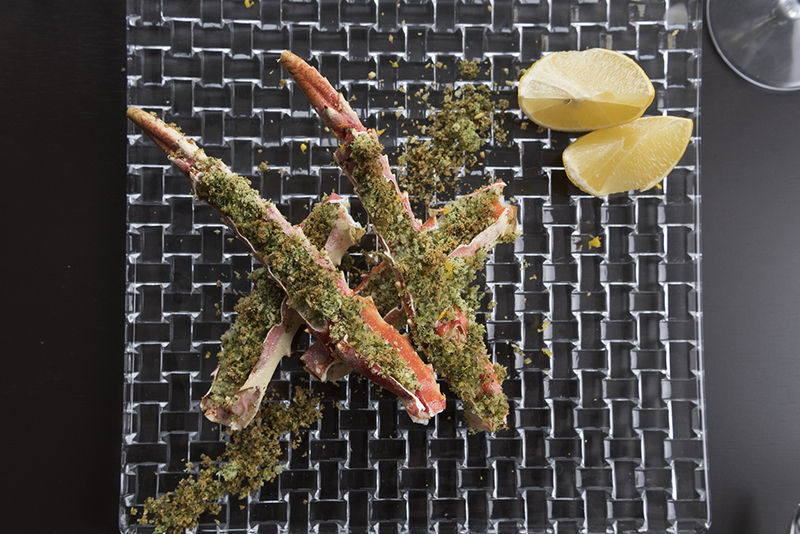 Chef Matsuoka’s other great skill is sourcing outstanding seafood and produce from around Hokkaido and Japan. 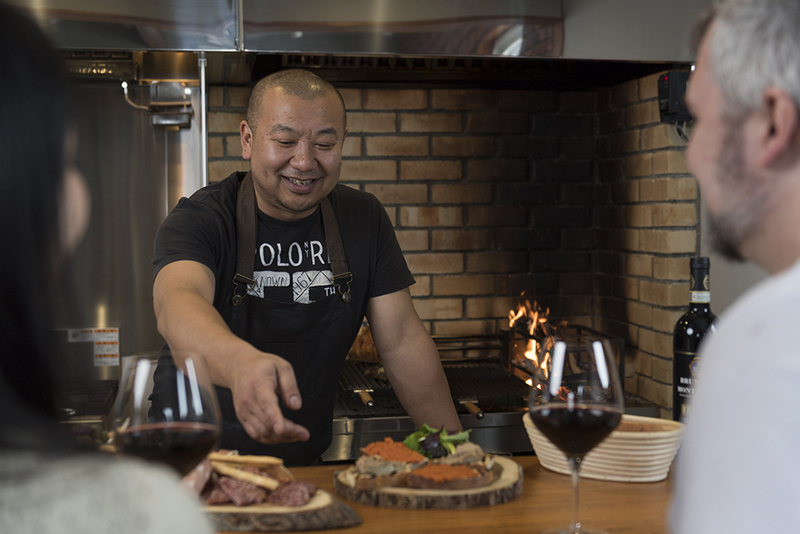 Wagyu beef and porked are sourced from across Hokkaido, and as a keen fisherman, Chef Matsuoka says he picks up plenty of tips from fisherman he knows and meets around the traps who can tip him off on what seafood is fresh and where. The high-grade ouma tuna sashimi is sourced from Aomori, just across the Tsugaru Strait on the northern tip of Honshu. 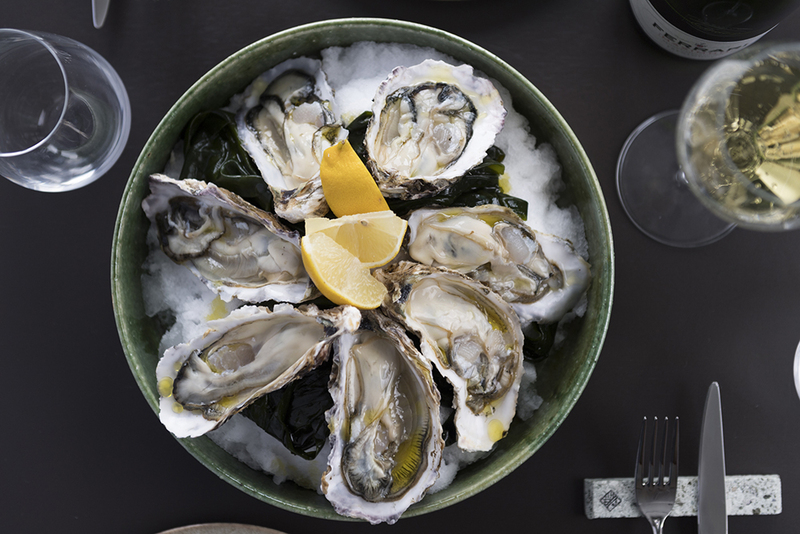 The oysters we ate on our visit were sourced from Senpoushi – a little-known seaside town near famous oyster-growing region Akkeshi in Eastern Hokkaido – and a little smaller and more delicate and mild in flavour than other big, bold Hokkaido oysters. The restaurant is warm and cosy with an open kitchen and grill in front of a long counter bench, with several tables. There are three courses to choose from, the simplest Course I starting at ¥10,000, Course II with a few more dishes priced at ¥15,000; and the full Course III priced at ¥23,000. Bi-on also offers an excellent selection of Italian and Australian wine to accompany meals, and a free pickup service from accommodation in the Hirafu area. Bi-on is open until the end of March before Chef Matsuoka returns to reopen Restaurant Nao in Chitose in spring. He will be back in December this year for the start of winter 2018/2019. We already looking forward to next season! A little break, non snow clearing! !